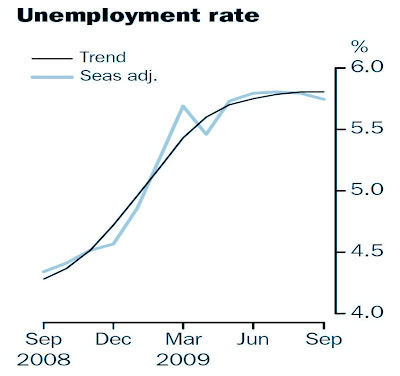 ADAM CARR: "It’s looking much more likely that the unemployment rate may be at or near a peak. I say that because this is the 7th consecutive month we’ve been around this level. Moreover there is no discernible move to shed labour and given the economy is on the path to glory I doubt very seriously it’s about to start." CHRIS CATON: "As amazing as it would have seemed six months ago, we now may have to contemplate the possibility that unemployment may already have peaked! 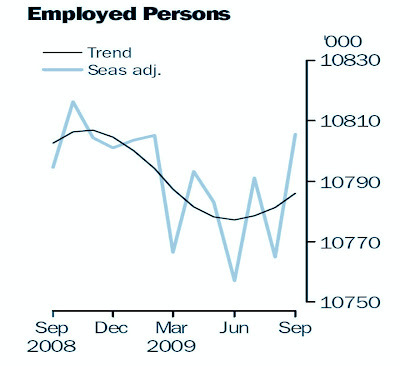 Recall that in the Budget, just five months ago, it was forecast that unemployment could reach 8.5-9% in this episode. At worst, a peak of 6.5% or less now seems in prospect." STEPHEN ROBERTS: "There is now a much more compelling case for the government to revisit its fiscal stimulus plans and make appropriate cuts to avoid unnecessary competition developing between the private and public sector for resources – including labour – as the economy continues to recover.